From December 30 to January 7, 53 students from various graduate programs at Columbia’s School of International and Public Affairs (SIPA), including students from the MPA in Environmental Science and Policy, traveled to Israel and the West Bank as part of the SIPA Israel Sustainability and Policy Delegation. 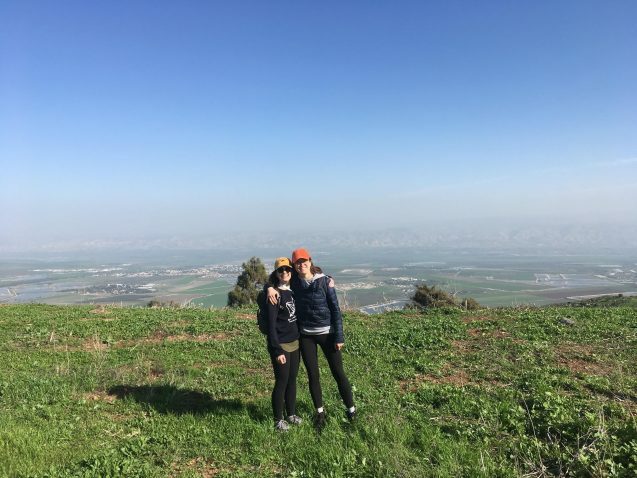 The trip was made possible in part by a generous grant from the Earth Institute travel grant program and was organized by three Israeli Columbia students. 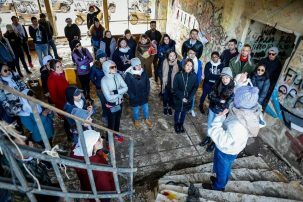 The group represented nearly 20 countries and the majority of students had never traveled to Israel before. The overall theme of the trip was that the situation in Israel is “complicated” and over the course of the eight days, we struggled to find answers to the following questions: what is considered part of Israel, why is the current geopolitical climate the way it is, how are resources managed, and how can peace be brought to the region? While the trip’s primary focus was environmental sustainability, with each day it became more apparent how closely tied environmental and resource management are to political conflict. Water is a scarce resource in the Middle East, and this scarcity will likely be exacerbated by climate change. Early in the trip, we met with retired Colonel Miri Eisen near the Syrian border and learned that withholding water is a weapon currently being used in the Syrian War. Despite this sickening case, we also explored how water can be a tool for peace. In response to the region’s water scarcity, Israel developed an innovative water strategy through advances in desalination, recycled water use, and efficiency. Israel has five operating desalination plants along its Mediterranean coast, and given how many plants it operates, the cost of desalinated water in Israel is substantially lower than it is in much of the world. A majority of the residential water used in Israel comes from these desalination facilities, and 85 percent of the water used residentially is then recycled and used for irrigation. Further, Israel’s water infrastructure is highly efficient, with only 8 percent leakage. Due to Israel’s innovation, it went from a water-scarce nation to a water-rich nation. It is now leveraging its expertise and resources to improve relations with its neighbors, including Jordan. As part of the Israeli peace treaty with Jordan, executed in 1994, Israel sends 50 million cubic meters of water to Jordan annually. Going forward, a large water infrastructure project, the Red Sea-Dead Sea project, is intended to assist Jordan in building a desalination plant in the Red Sea, which will allow the two nations to trade water, increasing water availability and reliability as well as strengthening the relationship between the two countries and maintaining peace. While Israel has successfully increased its water supply in the face of natural scarcity and climate change, its management of natural resources is complicated by the Israeli-Palestinian conflict. Many Israeli government officials and representatives from coexistence organizations such as EcoPeace Middle East are proponents of addressing environmental management across Israel and the West Bank today, rather than waiting for a peace agreement. In contrast, many Palestinians refuse to engage or collaborate with the Israeli government until there is an end to the Israeli occupation of the West Bank. The Sustainability and Policy Delegation with EcoPeace Middle East Palestine Director Nada Majdalani (center) in Ramallah in the West Bank. Wastewater management is a clear example of how the geopolitical conflict exacerbates environmental problems in the region. Currently, untreated sewage from the West Bank runs-off into Israel, threatening limited freshwater resources. We learned from Nitsan Levy, a director general of the Municipal Association for Environmental Quality, that the Israeli government financed a wastewater pipeline in the West Bank to be used by Israeli settlements and Palestinian cities. At this time, no Palestinian cities have connected to it, potentially due to a lack of basic infrastructure needed to connect to the pipeline. However, another crucial reason for not using the Israeli-built infrastructure is the Palestinian fight for sovereignty. According to Nada Majdalani, the EcoPeace Middle East Palestine director, the Palestinian Authority’s (PA) current policy is to not engage in projects with Israeli settlements, which are recognized by international law as illegal, in order to avoid granting them legitimacy. The PA prefers building its own wastewater treatment systems, but in order to acquire land on which to build, it needs the approval of the Israeli government. Thus, improving wastewater treatment in the West Bank is extremely challenging, and continues to threaten the environment and quality of life in both the West Bank and Israel. Despite the complicated and often troubling dynamic of environmental management in the region, we visited two Israeli organizations that inspired hope: the Arava Institute for Environmental Studies and Sindyanna of Galilee. These organizations bring people of diverse backgrounds together in an effort to promote peace and understanding. The Arava Institute brings Israeli, Jordanian, and Palestinian students together to further cross-border environmental research and collaboration. Meanwhile, Sindyanna of Galilee is a woman-run nonprofit organization certified as a fair-trade olive oil producer that hires both Arab and Jewish Israeli women to bridge the cultural divide. In our time with both of these organizations, it became clear that through spending time with people of different backgrounds, we are often able to connect and to find common ground, and that such interactions can have long-term implications for peace. While we left Israel with more questions than answers, we return to Columbia feeling even more fortunate for the opportunity to learn with peers from all over the world and with a desire to continue learning about this complicated region. For anyone enrolling in the MPA in Environmental Science and Policy program in future semesters, we highly recommend taking advantage of the SIPA Israel Sustainability and Policy Delegation if you have the opportunity. 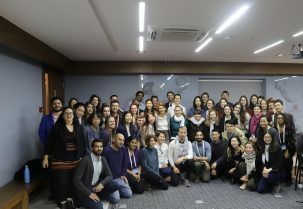 This trip gave us the chance to have a unique, applied learning experience abroad with graduate students across the larger Columbia community and we’re thrilled to have been a part of it.